We use the four gift rule for Christmas: something you want, something you need, something to wear, and something to read. I take the ‘something to read’ gift very seriously! Our home library grows all year long, so I want our Christmas gift books to be extra special. Children’s book treasuries and collections make wonderful gifts for Christmas or any other special occasion. Treasuries take up less space than having lots of individual books, and you only have to put one book away 🙂 Not to mention, buying a treasury is more cost effective than buying separate books. There are some things to keep in mind, though. Sometimes pictures are sized down to fit the new format of the treasury. In some books, a few of the original pictures are omitted. This really makes some people mad! If you are one of those people, make sure to read the reviews and check the book’s dimensions before buying. James Herriot’s Treasury for Children This is an often-recommended treasury for the early years! Jan Brett’s Animal Treasury – Jan Brett’s beautiful illustrations and engaging stories are favorites of many families. Many of her stories are based off of folk-tales from other countries. Her books are sometimes considered light reading, but any child would love to have this treasury! Frog and Toad Storybook Treasury – The adventures of these sweet friends are perfect for young readers. The Complete Adventures of Curious George There is some debate as to whether or not Curious George has a place in the Charlotte Mason early years, but we enjoy this silly monkey! I consider the classic stories to be delightful light reading. The new adventures, rewritten by other authors, aren’t as delightful, and aren’t written in such beautiful language. If it says “Margret Rey’s Curious George,” then it is a rewrite. Paul Galdone Classic Folktales Treasury – Paul Galdone does justice to well-known folk tales in his retelling and art. English Fairy Tales: By Joseph Jacobs – Illustrated I struggled with knowing which fairy tale collection to buy, but the answer is this one. 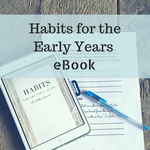 Ambleside Online recommends this book for the early years. The Complete Brambly Hedge – These sweet little animal stories are accompanied by beautiful, detailed pictures. The stories are filled with themes of community and joy. This is one of our favorites. The World Treasury of Children’s Literature– This book seems to be out of print, but you can find used copies at reasonable prices. This book has classics like The Little House, The Little Engine that Could, and Robert Louis Stevenson poems. Ezra Jack Keats Treasury – A Snowy Day was one of Miss H’s favorite books at a very young age. Recently, we discovered Jennie’s Hat and Miss H was delighted with Jenny’s creativity and her nature friends. This treasury has those two stories, plus eight more. The pictures are reduced in this edition, which some people will find upsetting! A Madeline Treasury: The Original Stories by Ludwig Bemelmans – We love Madeline stories, as long as they are written by the original author! Mike Mulligan and More: A Virginia Lee Burton Treasury – What I love about Virginia Lee Burton is that she keeps ME on my toes. Not only are her stories crafted to keep children interested, but I find myself excited to know what happens next. The Magical World of Strega Nona: a Treasury – I loved Strega Nona as a child! These magical stories are beautifully illustrated, as well. Elsa Beskow Gift Collection– This technically is not a treasury, but I couldn’t leave this out. I’ve recently discovered Elsa Beskow’s beautiful books. They were written in the early 1900’s, and most of them are nature-themed. Her illustrations are so gorgeous that publishers are still creating calendars, alphabet book s, and grownup coloring books . This collection features miniature editions that are about 5 inches tall. This is Miss H’s ‘something to read’ this year. Make Way for McCloskey: A Robert McCloskey Treasury – Robert McCloskey wrote and illustrated beautiful stories. We love this treasury, filled with classics Make Way for Ducklings and Blueberries for Sal. Beatrix Potter the Complete Tales (Peter Rabbit) -Ambleside Online recommends a Beatrix Potter collection on their year 0 (preschool) book list. We actually have two of her collections because I wanted one that my kids could flip through without having to worry about pages getting ripped. A Christmas Treasury– My friend Cindy from My Life as a Rinnagade recently posted about this Christmas Treasury from Barnes and Noble. It has complete versions of classic stories like A Christmas Carol and The Gift of the Magi. At the time of this post, the hardcover version is sold out online, but you might be able to snag one in stores! Jan Brett’s Christmas Treasury – This is out of print, and I’m kicking myself because I had this as a public school teacher, and got rid of it. This is a beautiful book filled with some of my favorite Jan Brett stories. You can still buy it used on Amazon. A Child’s Book of Poems – This is becoming my new go-to gift. Gyo Fujikawa has beautiful illustrations, and this books is filled with classic poems that children love. Switching on the Moon: A Very First Book of Bedtime Poems We have this sweet collection of bedtime poems. Not every single poem is “living,” but as a whole, this book is beautiful and worth having! Our favorite in this collection is Sweet and Low by Alfred Lord Tennyson. Frederick’s Fables- Leo Leonni’s stories are creative and often full of resourceful problem solving. This treasury amazingly has 16 of his stories. To make room, some of the pictures have been left out, which might disappoint some! The Alfie Treasury – This out of print book is expensive on Amazon, but you might be able to find it on eBay or Thriftbooks (this is a referral link, and through it you can get 15% off of your first purchase at Thriftbooks!) Alfie is a sweet toddler whose life is told in beautiful language. We have this, and Miss H loved it and wanted to read the whole thing at once. I think it would be perfect for two and three year old children- I can’t wait to read it to E! There are other great treasuries that are worthy of a place on your book shelves. Would you add any other treasuries to this list? This is a great list! James Herriot, Rober McCloskey, Elsa Beskow and Brambly Hedge are all making it into our home this Chrismtas (we’re not buying them allI should add, thank goodness for Grandparents!) Beatrix Potter and Shirley Hughes are big favourites of ours so far.